We are Celebrating the launch of our two new Vytronix models by giving away a Brand New Vytronix Animal Multi Cyclonic Bagless Cylinder. To enter our competition you need to head to our Facebook page and tell us the name of your beloved pet/s in the Comments section. Share our post to help spread the word! The winner will be announced Tuesday 3rd October 2017 on Facebook. Please make sure you read the full list of Terms and Conditions under the 'Competitions/Promotions' section before entering the giveaway: https://www.directvacuums.co.uk/terms-and-conditions. This giveaway is run by Direct Vacuums and is not in association with Facebook. Tell us in a comment which one of these two vacuums do you think your mum would love and why. The competition ends on Tuesday, 21st March at midnight. The lucky winner will be selected through a random draw and announced shortly after. Please note that there is only 1 prize per competition. Don’t forget to share our Facebook post if you want to spread the word about the giveaway with your friends and you can also like our Facebook page if you want to keep an eye on our latest deals and competitions. Direct Vacuums reserves the right to remove any photos or comments that are deemed inappropriate or offensive. In order to participate you must reside in UK mainland and be over 18 years of age. Get Your Hands On a Brand New VYTRONIX Vacuum. We’ve Got One Free Vytronix to Give Away…Entering Is So Easy! 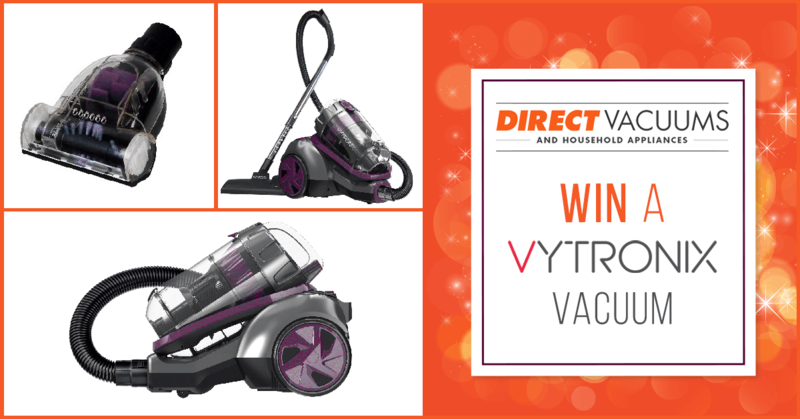 This year, we’re helping you get ready for Autumn Cleaning with a brand new giveaway for a brand new vacuum cleaner: Vytronix! This recently launched vacuum cleaner is a powerful and compact cylinder vacuum that was built for your everyday cleaning needs and is attracting five star reviews from buyers for its combination of performance and affordability. Easy to store, lightweight and with the revolutionary 4 stage HEPA filtration technology that traps 99.9% of allergens and other dust particles, the Vytronix vacuum cleaner is perfect for hassle-free cleaning sessions! 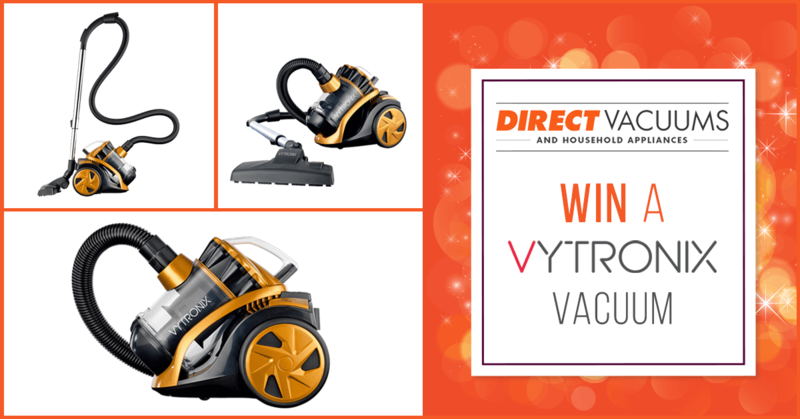 All you need to do to enter our giveaway for a chance to win a brand new Vytronix vacuum worth £79.99 is visit our Facebook page and tell us what’s your favourite feature in a vacuum cleaner. The giveaway ends on Monday, 3rd October at midnight and the winner will be selected via a random draw and announced on our Facebook page. Please note that there is only 1 prize per giveaway and make sure to read our full Terms and Conditions for ‘Competitions/Promotions’ available on our website before entering the competition. Direct Vacuums reserves the right to remove any photos or comments that are deemed inappropriate or offensive. 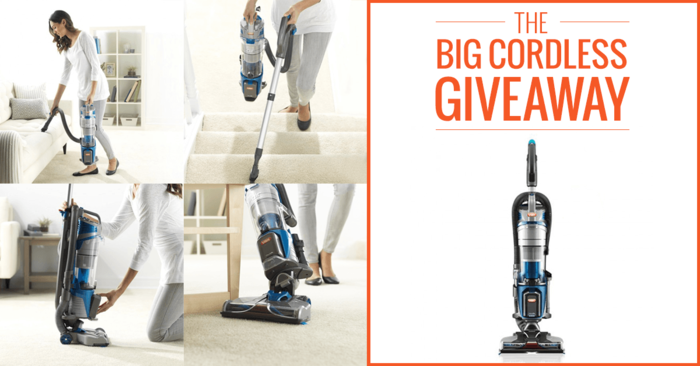 This giveaway is run by Direct Vacuums and is not in association with Facebook. Father’s Day is coming up this weekend and we’re celebrating with a new giveaway! This time the prize is a pressure washer kit worth over £100 that comes with this refurbished Vax Pressure Washer with a built-in air compressor and this Vax Powerwash Car Cleaning Kit, so your dad can easily clean his patio/driveway/car or other outdoors surfaces. 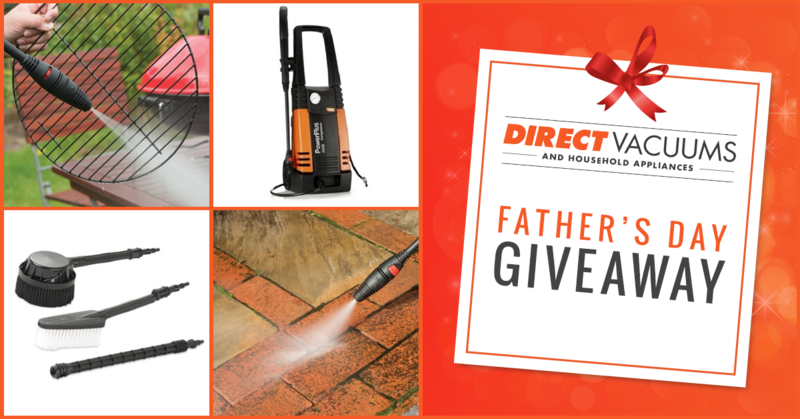 All you need to do to enter this giveaway is head over to our Facebook page and give us your reason why your Dad needs this pressure washer in his life. The giveaway ends on Sunday, 19th June at midnight and the lucky winner will be selected via a random draw and announced the week after. Please note that there is only 1 prize per giveaway and make sure to read our full Terms and Conditions available on this page under the ‘Competitions/Promotions’ section before entering the giveaway. Don’t forget to share our Facebook post if you want to let your friends know about this fantastic giveaway! Mother’s Day is coming up in March so we’ve decided to organise another great giveaway to celebrate this special day with all our followers and offer you the chance to win a £100 voucher that you can use with any one of the products available on our website. 1. Check out the products in our Brand New Kitchen Appliances range. 2. 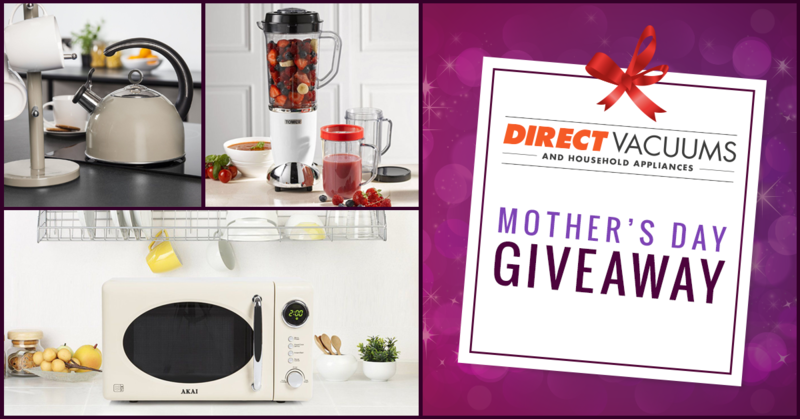 Pick one item you’d like to offer as a Mother’s Day gift. 3. Head over to our Facebook page and leave a comment with the name of that item. Easy, right? The giveaway ends on Monday, 29th February at midnight. The lucky winner will be selected through a random draw and announced shortly after. Please note that there is only 1 prize per giveaway. Direct Vacuums reserves the right to remove any photos or comments that are deemed inappropriate or offensive. In order to participate you must reside in UK mainland and be over 18 years of age. Please make sure you read the full list of Terms and Conditions under the 'Competitions/Promotions' section before entering the giveaway: https://www.directvacuums.co.uk/terms-and-conditions. 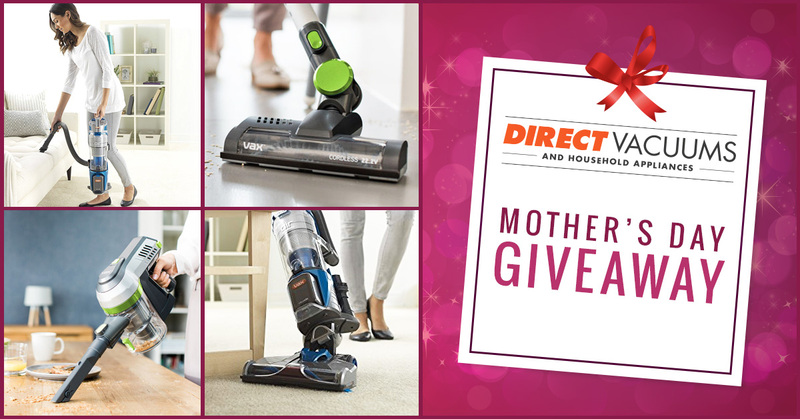 This giveaway is run by Direct Vacuums and is not in association with Facebook. 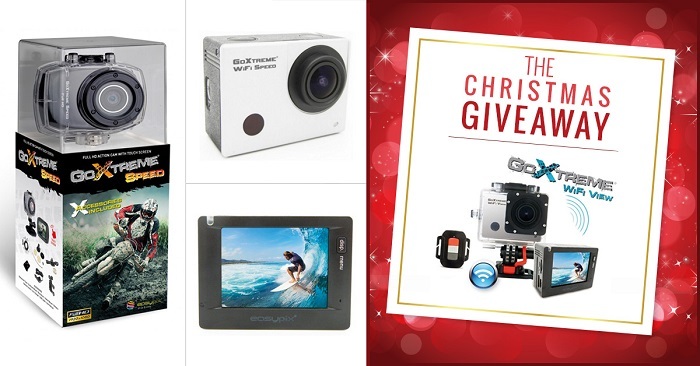 Christmas is the time of giving, which is why we’re organising another fantastic giveaway for all our followers! This time, the prize is this fantastic Goxtreme WiFi Speed Action Camera worth £199.99, the perfect Christmas gift that will help you capture priceless memories and adventures together with your family and friends. To enter the giveaway is easy. All you need to do is head over to our Facebook page and write a comment tagging someone you would give the prize to as a gift and telling us why you chose that person. Don’t forget to like our page and share our post to spread the word with your friends! Facebook tagging is non-compulsory, you can simply write their name or say who they are to you. The giveaway ends at midnight on Sunday, 13th December. The winner will be selected through a random draw and announced shortly after. Direct Vacuums reserves the right to remove any photos or comments that are deemed inappropriate or offensive. In order to participate you must reside in UK mainland and be over 18 years of age. 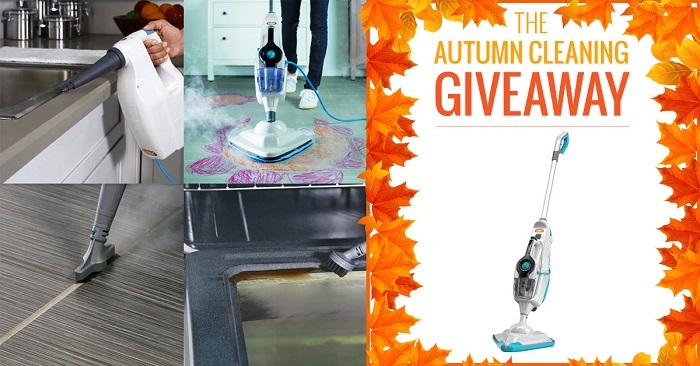 With Autumn Cleaning becoming the new Spring Cleaning, we’ve decided to make your life easier this time of year by offering you the chance to win this brand new Vax 10 in 1 Steam Mop! Save £179.99 and take advantage of this versatile steam cleaner and mop that comes with a 10-piece accessory kit so you can easily clean all sorts of surfaces, leaving them spotless and ready for winter. The giveaway ends at midnight on Saturday, 31st October. The winner will be selected based on a random draw. Direct Vacuums reserves the right to remove any photos or comments that are deemed inappropriate or offensive. In order to participate you must reside in UK mainland and be over 18 years of age. Direct Vacuums started their new series of competitions with a Facebook giveaway where this fabulous Cordless Vax worth £349.99 was the much desired prize. In order to enter the giveaway, participants had to like our official Facebook page, share The Big Cordless Giveaway with their friends and upload their favourite housework selfie. The response was incredible, with hundreds of likes, shares and fantastic comments and photos. This was just the beginning of many other competitions to come, so make sure to like us on Facebook and follow us on Twitter to find out when our next giveaway or competition will take place!